First off, I should point out that this book has NOTHING to do with the two Alfred Hitchcock movies of the same name (1934 with Peter Lorre and 1956 with Jimmy Stewart). They just happen to share the same name. In 1922, G. K. Chesterton took a break from his successful series of “Father Brown” detective stories to write a series of eight connected mysteries featuring a young writer named Harold Marsh and a cynical older detective named Horne Fisher. The connecting feature of each of the stories is that, for each of the crimes committed, placing the blame on the actual criminal would cause more harm than good. This is a hard Sci-Fi story exploring themes of perception, intelligence and self-awareness. The story tracks three major plot lines: the Chinese government’s response to a lethal virus, a blind girl and the experimental treatment which may allow her to see, and the breakthroughs made by an underfunded primate language research team. By the end of the book, two of these plotlines have intersected and fused into a single story, while the third is, sadly, left isolated and unresolved. Imagine that there is a city where, whatever it is that you personally obsess about, they have it there and it is better than anything that you have ever found elsewhere. That’s the city in Palimpsest. How do you get there? Well, that’s the problem, isn’t it. This is billed as a “Story of 22nd Century America!”, but the overall feel is more like a tale from some time in the 1800’s. You see, it’s post- economic and energy collapse America, and now that there is no easy access to fossil fuels, the world has reverted to steam and muscle power. Also, the stated policy of the new Fundamentalist government is that humanity was punished for the sin of pride, and that the only path for redemption is to live as they did in a simpler, more God-fearing time. If you read geeky stuff (and what are you doing here if you don’t?) then you’ve probably seen the cover of this book at any number of other web sites. It’s a sepia-toned close up of a woman wearing brass steampunk goggles with an ornate airship reflected in the lenses (actual image here just in case you haven’t seen it). 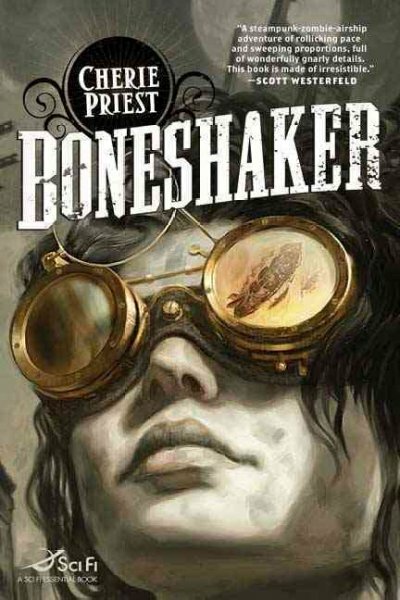 If you’re wondering if Boneshaker might appeal to you, that image right there has 90% of what you need to know. The only thing it leaves out is the horde of zombies. First off, some quick background: there’s a group of us who are undertaking what my wife calls the Crazy Hugo Project. We’re going to read all of this year’s Hugo Award nominees before the voting due date. The first one I’ve tackled is China Miéville’s The City & The City. This is going to be a tough book to review, just like it was a tough book to read. It was written in 1877, and in Imperial Russia, both of which make it tough for a modern American reader. Every time I picked this up, it was an effort to wade back in. Tolstoy’s characters go off on interminable journeys of internal dialogue and philosophizing about the evolving role of nobility in society, on the virtues of hard work, of love and duty and all sorts of weighty important topics. This was a collection of three Nero Wolfe short stories that I picked up at a local used book shop. Each of the stories features the regular cast of characters – Nero Wolfe, Archie Goodwin, Inspector Cramer, and so on – and the stories follow the not-exactly-contiguous continuity that Rex Stout adopted after the first few books. The stories were first published in the early 1960’s, but they could easily be re-set anywhere from the 40’s to the 70’s. Out at the edge of a tottering empire, a traveling scholar has found a man that he believes was once the greatest magician adventurer of recent memory. This man was a brilliant bard, a notable swordsman, and one of the few to master the deepest magic – commanding the structure of reality by calling on things by their True Names. Unfortunately for the scholar, this man is now living incognito as a humble innkeeper, and he refuses to tell his life story to anyone. Only as evidence mounts that an ancient evil is stirring again does he break this silence. The latest novel in the Harry Dresden series, “Changes” does exactly what it says on the cover. It changes everything.